The theme breaks out the key phrases of the classic Marvin Gaye/Tammi Terrell Motown hit, “Ain’t No Mountain High Enough.” If you don’t know the song, have a listen here. I nailed MOUNTAIN HIGH and VALLEY LOW, but tried RIVER DEEP before RIVER WIDE, and confess I had no idea the end of the chorus was GETTING TO YOU (the [Objective in the 1967 R&B hit], the other themers being clued as the first, second, and third obstacles in that song). Nice how the key phrases split into chunks with symmetrical letter counts, but I really would have liked to see AIN’T NO in the grid too. 5d. [They populate impound lots], TOWAWAYS. Is this a regionalism? I’ve never heard this as a noun. 16a. [“Stop being so silly!”], “OH, YOU!” This is the second puzzle I’ve seen in recent days with this entry, which I don’t much care for. It’s better than OH ME and AH ME, at least. 12d. [Person behind the hits? ], DON. From the Mafia? Okay. Really wanted this to somehow fit MARVINGAYE or BERRY GORDY, given the theme. 24a. [“The daily diary of the American dream” sloganeer, for short], WSJ. 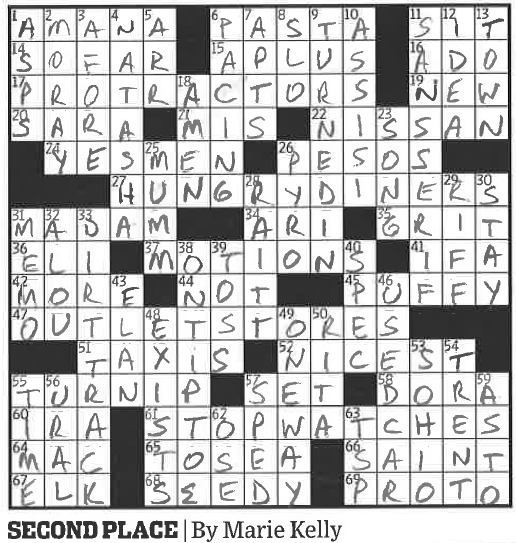 The WSJ just added five new crosswords, Mon-Fri 15x15s, with the Friday being a contest puzzle each week. The usual 21×21 Friday WSJ moves to Saturday. No .puz file yet, and I haven’t been able to get the Java version to work; the PDF is free to access, though. Puzzle links available here; Monday and Tuesday puzzles are up so far. Wasn’t wild about the overall fill. ARCO ESAI ESME OTIS are maybe a bit tough for a Tuesday. Five stars for the song, 3.75 for the crossword. 48A [Maui tourist attraction ___ Valley (hidden in CIA OPERATIVE)] IAO – For those of us that have never been to Maui, the not-so-subtle hint is greatly appreciated. It does look beautiful, though. A trip there is now on my bucket list! 2D [Oregon’s fourth-largest city] GRESHAM – This was a gimme for me, since I was just in that area last week! 61D [ ___ Kippur] YOM – Timely, since it’s next Tuesday! Matt Jones and me in Portland last Wednesday! Well, look who I found in Portland last week! 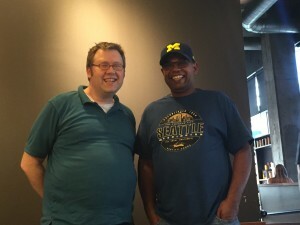 Had a nice time with Matt last week for a bit, and got to talk puzzles and trivia, not to mention I got to ask him some local questions about the Portland area, which may be a destination for me when my UPS days are over. As you can see, the relationship between constructor an blogger is a good one! See you for next week’s Jonesin’! 5D [Went for a burger, say] HAD LUNCH – Nicely done. 37D [Norse mischief-maker] LOKI – A little more popular perhaps with the Thor and Avenger movies that were recently made. 42D [Black-and-white, e.g.] TWO-TONED – I put in TWO COLOR at first. Nice misdirection! Nice puzzle. 3.7 stars and a fun solve. 17A.▇19A. TOLL PLAZA▇LEAST; [Collection area on the road] [Last but not ___]. 27A.▇31A. 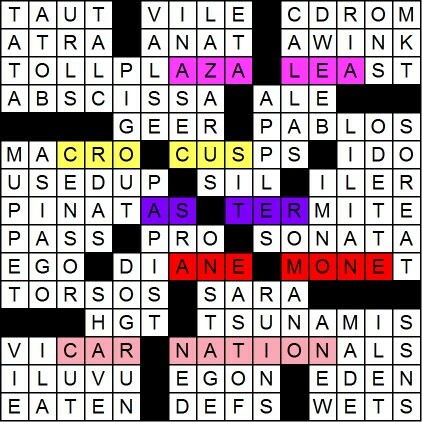 MACRO▇CUSPS; [Computer user’s timesaver] [Zodiac boundaries]. 38A.▇40A. PINATAS▇TERMITE; [It’s okay to hit on them at parties?] [Unwanted guest who eats you out of house and home?]. 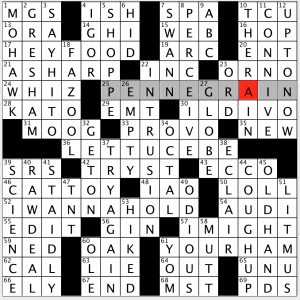 Of the three “grid-spanners,” I think this one—right across the center with that central block—is my fave, and not only for the answers, but for the playful cluing—for both words. Especially for the latter. It’s no mean feat to make the prospect of a TERMITE problem playful, so that’s sayin’ somethin’. 60A.▇63A. VICAR▇NATIONALS; [Parish priest] [Washington team]. I love this theme and the way it’s been executed. 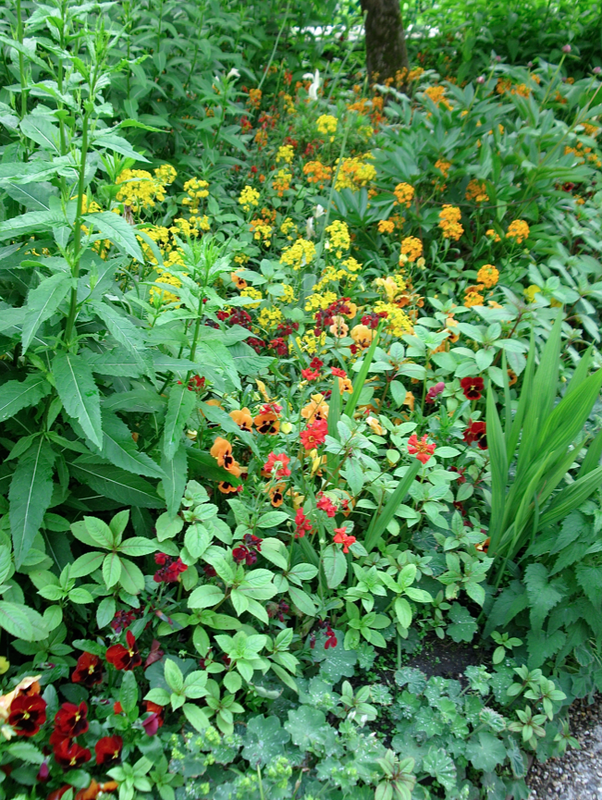 I’m also deeply fond of a lot of the remaining fill and the interconnectedness within much of that. In addition to the von Fürstenberg duo, we get a couple of sharp Italian cheeses for tasty Italian food, for example: ASIAGO (for lasagna) and ROMANO (for pasta). In the world of fine arts, we encounter not only MONET, but also diva Maria CALLAS (depicted ON STAGE in Terence McNally’s Master Class) and two PABLOS, artist Picasso and cellist Casals. Oh—and there’s “Swan Lake”‘s ODETTE peeling off the “O” of PABLOS. There’s more music to be found not only in SONATA [Beethoven’s “Spring” for violin and piano], but also in [Ravel’s “La VALSE“]. Treat yourself. Here’s a performance of it with Leonard Bernstein conducting l’Orchestre National de France. But not-to-worry: the fill isn’t all “highbrow.” In the world of pop culture, we get LILIAN Jackson Braun, author of the (rather gentle) “The Cat Who…” mystery series. Until solving, I was unfamiliar with the award-winning Ms. Braun, but how can ya not love the title in the clue: The Cat Who Ate Danish Modern? Robert ILER […played a TV Soprano]; Will GEER was the patriarch of The Waltons; singer/songwriter SARA Bareilles of “I Choose You” will be represented on Broadway this spring with her score for the musical of Waitress. And hooray: MUPPET [Kermit or Oscar] (well, the whole gang, actually) will be returning to network TV one week from tonight. Read all about it. It’s been a looooooong time since I’ve been in a math class, so thank goodness for the crosses, because otherwise I don’t know how I’d’ve gotten ABSCISSA, most basically defined as [Graph coordinate]. Here’s a more detailed description of this term used in algebraic geometry. Uh. I think I musta been absent that day… And I found it a tad disconcerting to encounter those [Waves of destruction] known as TSUNAMIS. But they’re out there (in the world), so they’re in here (in this tiny microcosm)… So I was glad to see LAZARUS, who was raised from the dead, and who serves as a balance (in my head anyway…) to the death that may come with TSUNAMIS. 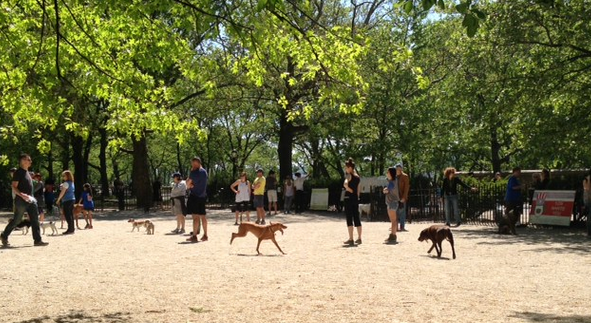 [“Before I LET you go…”]—and I will, “IN A SEC“–let me add that far happier making is the colloquial PIG OUT, and the whole image that comes to mind for DOG RUN [Pooches’ place in the park]. And that, folks, is a wrap for today. If I haven’t given a shout-out to your personal faves (the [Delicious fruits?] APPLES combo, or DWEEB or maybe “I LUV U”), do speak up. “TA-TA” for now! 17-Across: PROTRACTORS. You know, those plastic thingies you use to measure angles? Each degree has minutes and seconds. 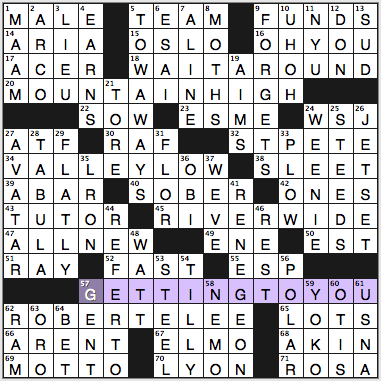 27-Across: HUNGRY DINERS. This is where my mind went immediately the first time I read the common clue. 37-Across: MOTIONS. All faithful fans of Robert’s Rules of Order will tell you a motion must be seconded before it can be discussed by the group as a whole. 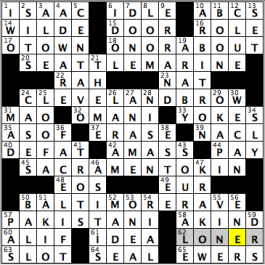 47-Across: OUTLET STORES, where you’ll find slightly irregular items (called “seconds”) for sale at deeply discounted prices. 61-Down: STOPWATCHES, one of which I used to record my solving time in minutes and seconds. This one took me nearly a minute longer than yesterday’s debut, suggesting the puzzles will get gnarlier as the week progresses. Yay! And remember, the Friday puzzle is supposed to be a contest. I think I know the answer already: FIVE! A lovely little 76/36, this one. (Trying to be genteel here. I’ve been watching The Great British Baking Show on PBS, and I just love how a reality competition series can feature hosts that eschew screaming and demanding judges that can also be polite and supportive. I don’t love how it makes me want to eat breads and pastries.) There are some interesting Downs like DIRT TRACK, ON TIPTOE, USED CAR, and TURNED IN. 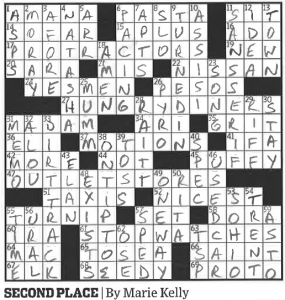 Overall a great easy-ish puzzle, as we would expect from Marie Mike. Never heard of MUMM, the [Major champagne producer]. As we say in my part of the country, if it don’t come from no can, ‘t ain’t worth drinkin’. Favorite entry = SANS SERIF, clued as [Like Helvetica and Futura]. Favorite clue = [Hamlet’s cousin?] for TOWN. Hello, everyone! Busy today with work, so can’t come with you with a complete review, but I love the cleverness of today’s puzzle, brought to us by Mr. Randolph Ross. In it, each of the theme answers are puns, and the each of the answers is also the name of a professional athlete…but with the last letter clipped off. 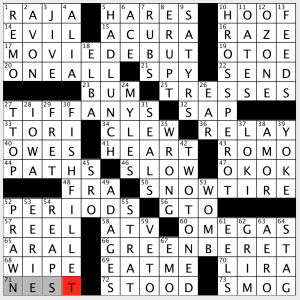 Only one of the four theme answers, at least from the version that I did, had a question mark at the end of the clue, which would denote a mislead/pun. Am pretty sure all four should have had the question marks. Oh, and the four theme entries pulled from three of the four major sports. Could we have had an answer from the National Hockey League that would be 13 letters? If there’s a famous person with the name of Wil (one L), then MINNESOTA WIL could work. Only other entry I could come up with is NEW YORK RANGE. Possible clue for that one: [Adirondacks, e.g.] Favorite entry in the grid, given my time working in radio, was ARBITRON (10D: [Radio ratings service]). “Sports will make you smarter” moment of the day: LA RAM (26D: [NFL’s Deacon Jones, once]) – He’s known as the greatest pass rusher of all time, but do you know the given first name of Deacon Jones, the late, great LA RAM who terrorized quarterbacks for so long that he ended up creating the term “sack?” Well, it’s David. Thank you for your time, and I’ll be here to provide you a longer, more detailed review of tomorrow’s grid. This entry was posted in Daily Puzzles and tagged Elizabeth C. Gorski, Iain S. Padley, Jerome Gunderson, Marie Kelly, Matt Jones, Mike Shenk, Randolph Ross. Bookmark the permalink. The confusion is understandable. “Ain’t No Mountain High Enough” (written by N Ashford and V Simpson) was released about a year after Ike and Tina Turner’s “River Deep – Mountain High” (written in part by P Spector). my LAT is a puzzle by Randolph Ross, down losded from Amy’s site. What gives? But only west of the Rockies, so it would be easy to be unaware the company exists if you live elsewhere. Thank goodness the NYT makes us West Coasters aware of Edy’s. Jonesin’: One minor addition, which enhances the title (and, I suppose, the rationale for the theme): the group’s second album was called Meet the Beatles. Loved the photo of Matt and Derek! So much fun to see faces to go with the names. I’m in the Portland area, too, so I second the idea of coming to Oregon for a visit. I have not been online for a while & got way behind in doing crosswords. I also missed out on a lot of news until weeks later (very sad to hear about Merl). Trying to catch up on several weeks works of puzzles.